Available in bronze or beige metal finish. 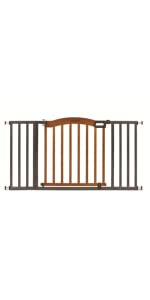 Summer Infant Gates are designed to meet and surpass ASTM Standards as administered by the Juvenile Products Manufacturers Association (JMPA). The Multi-Use Deco Extra Tall Walk-Thru Gate can be used between rooms to keep your child or pet in a safe and secure location. 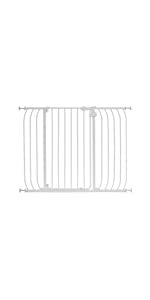 The Multi-Use Deco Extra Tall Walk-Thru Gate comes with hardware to provide extra security when used at the top of the stairs. 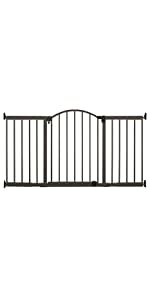 The Multi-Use Deco Extra Tall Walk-Thru Gate includes one 8.75 inch extension and two 4.25 inch extensions. 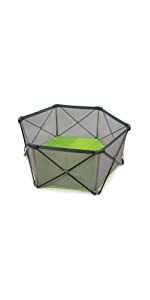 This allows the gate to fit: (1) 28 to 31.5 inches without extensions, (2) 32 to 36 inches with one 4.25 inches extension, (3) 36.5 to 40.5 inches with one 8.75 inches extension, (4) 41 to 45 inches with one 4.25 inches and 8.75 inches extensions, and (5) 45.5 to 48 inches with two 4.25 inches and 8.75 inches extensions. This gate accommodate hallways and door frames. In addition, this gate accommodates baseboards. 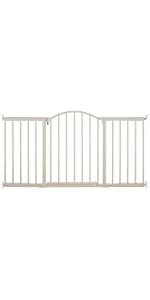 The Multi-Use Deco Extra Tall Walk-Thru Gate stands at 36 inches tall, ideal for use with toddlers and small pets. 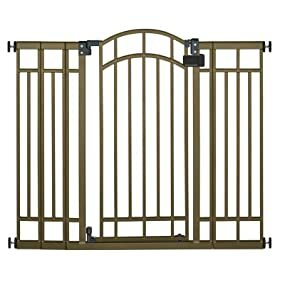 Hardware is optional with this gate to make installation more secure. When mounted with hardware and the included door stopper, the gate is ideal for use at the top or bottom of the stairs. Tools are required for hardware mounting. 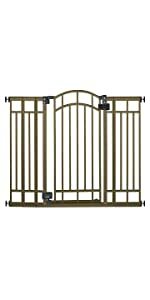 The Multi-Use Deco Extra Tall Walk-Thru Gate features a convenient auto-close. When walking through the door, it will gently close behind you. When used between rooms, the gate door opens in either direction and can be operated with just one hand. When used in a stairway, the included door stopper allows for added security, preventing the door from swinging open over the stairs. The dual locking system provides peace of mind, so you know your gate is securely locked every time!